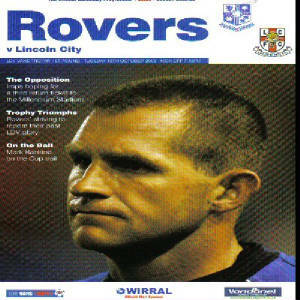 Ahh, the good old LDV Vans 1st Round draw had paired the Imps with Tranmere Rovers, a ground most City fans' wouldn't visited before this game. However, I had come here for their playoff defeat against Hartlepool. Getting to Tranmere from Lincoln is fairly awkward although you do get a lovely trip through the country side and are treated to some of the most amazing views you’ll ever see, including a sheep falling down a hill before finally rejoining the motorway near Manchester. Once we finally got to the ground (and made our usual trip to the completely opposite side to the away turnstiles), we were greeted by a policewoman who, despite trying her hardest, wasn’t particully amusing and once we’d have our lecture, we made our way to the club shop where, to be fair, there wasn’t a great deal on sale. Then came the long trek to the turnstiles and once I finally got in, it was time to go to the toilets and if you don’t have your wits about you, this could confuse the hell out of you. Basically, you quite literally can’t get in the outdoor and out in the outdoor. There’s no handle on the “IN” door so you can back out that way and one the “OUT” door, there’s no handle to pull the door open to let yourself in, the word WHY springs to mind. 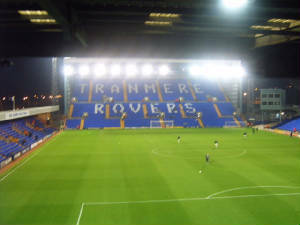 Finally, we emerged into the ground and if you want an exercise, then Prenton Park is defiantly the ground for you. I’ve never been so knackered when climbing to the top of a stand in all my life, but once you get up there, it is defiantly worth it. The away end, being as steep as it is, means that even the person in front of you doesn’t block your view of the goal-line. Looking out from the away end, the ground is quite good and if it wasn’t for a dodgy color combination in the stand to our right, then it would be a great ground. The stand opposite away fans is very similar to Nottingham Forest’s Trent End, it is HUGE and could hold around 9,000ish on it’s own. The stand to the left is quite small in comparison to the other stands but for overall quality, easily beats the final stand, which although fairly large, is let down by it’s decision in the middle to chance colors from seat to seat from red, to yellow, white, blue, red and so on. The atmosphere, to be honest, is a bit crap, in the LDV game, there was no atmosphere at all, little had changed since the playoff game where, even after they’d pulled the tie back to 2-2, they still seemed quiet as a mouse. I’m sure on it’s day, it could create a fantastic atmosphere but from what I’ve seen, it’d have to be something extremely special to do it. 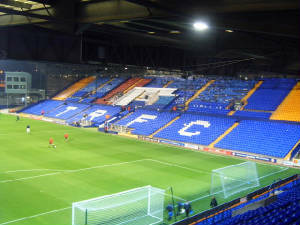 Overall, I enjoyed both trips to Prenton Park and would definitely go again if I was given the chance.